2) The emotions are very high in this scene you can tell she loves him and is frustrated because he does not show the same feelings. Cukor supports this with the emotions he is having her show in this scene. 3) at this point you see that Eliza is frustrated because she is in love and Higgins does not show this back just her reactions to everything being very dramatic. As in Gaslight, I seem to remember shadows being in scenes that supported condescension. In the case of My Fair Lady, Eliza seems to fade into the wallpaper, as she stands in a shadow in the back of the room, when Higgins is bragging to everyone and not including her efforts in winning the bet. Also, after the "I've grown accustom to her face " monologue, Higgins sits in a chair, listens to the phonograph and there is a shadow on the floor. Of what, I do not know. It moves. Miss Doolittle had not yet entered the room. But when she does enter, fashioned to induce a soft pink aura from head to toe, it changes the whole scene from woe to romance. A couple of comments on the Daily Dose notes. First, Cukor was called a woman's director because that was code to signal others that he was gay, not that he was better at working with women than men. Second, Cukor was not fired as the first director of GWTW because he was a woman's director. Selznick knew Cukor well as they had worked together quite a few times before and were friends. Selznick knew that Cukor was gay and hired him anyway. The reason Cukor was fired was because he had trouble with the pace and timing of the direction on that particular film. If you watch some of the early scenes directed by Cukor, they drag a bit and the tempo is slow and a bit boring. Although some of those scenes made it into the final film, it fairly easy to tell a Cukor directed scene from those directed by Victor Fleming, or Sam Wood. Also, Cukor was behind schedule. Third, Clark Gable did not like Cukor, and he was a star who had enough clout to demand that a director be replaced. (A bit homophobic perhaps?) Fourth, and this is ironic given this discussion, but Cukor was reassigned to "The Women." I would say he did a bang up job on that movie, wouldn't you? 1.Explore any common themes and filmmaking techniques in a very different movie also directed by George Cukor, Gaslight. (If you are not familiar with Gaslight, compare and contrast Cukor's theme in this scene and his techniques with another musical you have seen during this course)try. Hmmm, I think it is a bit of a stretch to think that "Gaslight" is comparable to "MFL," but I will try. In MFL, we are watching one of the final scenes in which Harrison's grand experiment, which exploited poor Hepburn, is over, and as she points out, he won. Everyone at the ball thought she was of royal descent. The room is dimly lit with gas lamps (stretching, stretching...), and Hepburn is upset because she will be leaving Harrison and the life with him to which she has become accustomed. Harrison seems completely unfazed, and not troubled at all to be losing her company, so Hepburn is angry and lashes out at Harrison for the mistreatment she has suffered at his hands, even though she had agreed to the entire scheme to begin with. She gets in his face and is yelling charges at him in an accusatory tone. Her conduct is irrational and not remotely ladylike. Hepburn is not exercising any self control because she is throwing heavy objects at Harrison with pretty good aim. Through the entire scene Harrison keeps his composure, which further maddens her. He's just not that into her. In "Gaslight," toward the end of the film, Bergman has had a belly full of Boyer too, although for very different reasons. Boyer has been slowly manipulating his wife to believe that she is losing her mind such that she needs to be incarcerated at an asylum. The reason for his torture of her is that he wants the house to himself so he can search for her aunt's jewels which he had to drop the night he killed her because a much younger Bergman interrupted his murderous attack on her aunt. Boyer has purposely sought her out in order to gain access to the house so he can complete the crime he started many years ago. In the scene in which Bergman confronts Boyer, she in not alone as in MFL, but is with trusty leading man and all around do-gooder, Joseph Cotton (actually a favorite of mine). In her verbal assault, Bergman dredges up all of the wrongful conduct in which Boyer has engaged during the course of her very unhappy marriage to him. Bergman conducts the inquisition using Boyer's own words with which he led her to believe she was losing her mind. Bergman, however is a better actress than Hepburn, and doesn't turn melodramatic in her emotional scene. She is tearful, but always displays frustration, not despair, nor does she whine about her disappointments. In Bergman's scene the audience is actually relieved that she has some spine left with which to take the evil Boyer to task for his crimes. In Hepburn's scene she is hysterical because she can't have a man who appears not to want her anyway. That is a bit too melodramatic a motivation for me. Cukor should have given Hepburn some guidance as to how to manage her big scene without descending into melodrama, when the motivation is not really there. She could have played the scene to express an emotional let down after the big party at which she was very much on display, but even that shouldn't lead a grown woman to hysterics. So the award goes to Bergman who knew how to avoid melodrama without the director explaining it to her. At any rate I don't think the two films have much in common at all. 2.Note the emotional transition moments in this scene, how the actors portray them, and how Cukor supports them. Hepburn's first transition into hysteria comes after she appears to be alone and upset in the study. She turns out the light, a nice bit of business Cukor gives her to do, while the music grows louder as she walks to the couch and collapses to her knees in tears. Once down, Hepburn shakes and pounds the sofa, but little transition prepares the audience for her throwing slippers at Harrison who has wandered into the room casually looking for them. After accusing him of not caring about her (which is apparently true) she actually states that she wants to kill him. (Bergman doesn't descend to that even though Boyer has killed her aunt). Once Harrison calls her a "creature" (Frankenstein?) she flies at him as if to scratch out his eyes! We really aren't prepared for that either. After Harrison corrects her grammar Hepburn settles down a bit. She then admits that no one has ill-treated her in the house, and reveals that the reason she is so worked up is that she doesn't understand her place in society anymore. Hepburn no longer fits in anywhere. 3.What do you notice about the relationship between Eliza and Higgins that seems enhanced by Cukor’s direction? Eliza respects her teacher, and his reasoning discussion with her serves to calm her down. Harrison remains her instructor who sees her as an "pretentious insect," who is a "creature," whose grammar he is still correcting. He offers her candy like a child, and tries to have her see that she is now free to do as she pleases, without understanding that such freedom is her problem; she doesn't know what to do with it. 1. Cukor was a master at having very full screen scenes. Being familiar with Gaslight as well I see the use of lighting and the full scene that he uses in all of his films. He also uses his actors and actresses to really play their emotions and scenes with such ease and flair. 2. Cukor was so very good at using his players to potray the emotions that these scenes would come to life. 3. Cukor's use of open or full scenes in his movies makes the full scope of emotions that the actors use come to life. You can feel the emotions not just because of Coker's direction but you have Audrey Hepburn who was a fantastic actress and played her parts so so very well. 1. 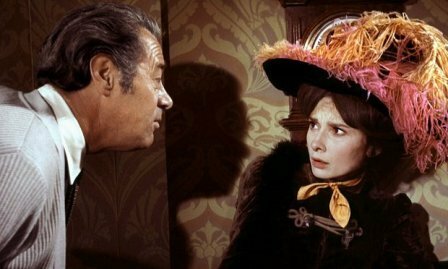 "Gaslight" (1944) and "My Fair Lady" (1964) are two of my favorite movies, and I think George Cukor did a great job directing both. While the former is a Gothic thriller and the latter an Edwardian-era musical, both take place in London around the turn-of-the-century, both deal with gender politics of the time between men and women, and the idea of personal identity. Cukor uses the production and set design for both in films in similar ways, emphasizing the dark, heavy, cluttered, and heavily-patterned style of the Edwardian era to create a sense of oppressiveness and wealth, though in "Gaslight's"' case the result is much more foreboding than in "My Fair Lady"! 2. There are a lot of emotions going on in this scene, and George Cukor does a great job of letting them flow naturally through his specific use of shots and lack of cuts. While there are a few close-ups of Eliza, the majority of the scene is covered in long tracking shots, almost like a stageplay rather than a movie, that show both characters at once and catch the breaks between lines, which also serve as the emotional transitions. The continuity seems to aid the actors in their performances; there is a cohesiveness and natural flow of the move from one emotion to another, which I don't think would have been as easy to achieve if Cukor had used a more fragmented approach with more cuts and shorter shots. 3. While it is a natural setup given the action going on in the scene, it's interesting to note the way Cukor has Henry Higgins (Rex Harrison) continually standing above Eliza (Audrey Hepburn) as she crouches on the sofa, emphasizing the superiority that Higgins is either purposely asserting over her, or that Eliza is merely imagining that she feels. It is also interesting how Eliza has her back to Higgins for most of the scene, which not only allows the audience to see her conflicting emotions, but externalizes her struggle to hide her unspoken feelings for him. An obvious similarity to both "Gaslight" and "My Fair Lady" was that the lead female characters are both in various ways manipulated and tossed aside once the goal of the lead male characters were met. This scene seems to be set in a way that gives both Hepburn and Harrison enough space physically to move around one another and enough space emotionally to wrap their thoughts and emotions around one another as well. It seems intimate and raw and yet honest and theres a sort of warm about the honesty in this scene even though Eliza feels used, discarded, and lost. I noticed that Eliza and Higgins are reacting to each other emotions and lack of emotions both in very emotional ways. Despite Higgins attempting to control his emotions he is reacting to Eliza instead of just simply ignoring. There in that scene is a hint that there may be more than meets the eye when it comes to Higgins affections towards Eliza (despite being in awe of her earlier at the ball). Eliza is affecting him in ways he isn't accustomed to and he see some authentic emotion coming from him as he reacts to her and her wailings. Gaslight and My Fair Lady share a common situation of dominating men. My Fair Lady has Higgins, basically taking a poor uneducated woman and turning her into a woman of high society. Focused on her education, appearance etc and put on a show for the everyone to see. Higgins pulled her strings. Gaslight focused on the ego and greed of Gregory. He sought out Paula to manipulate her and drive her crazy to get his hands on jewels, Paula's Aunt Alice hid, before she was killed by Gregory. Backgrounds in scenes in both movies served as another character you focused on. For example, in Gaslight, Paula started noticing the gas lamps started to flicker then she heard foot steps. She could not understand what was going on. Eliza quickly breaks down, at first Higgins is completely lost. He does not see what the true problem is and toys with her emotions. Cukor makes you focus on the body language of his characters. Eliza stays away from Higgins. He slowly comes into the room, but his demeanor is very cold. Higgins tells Eliza that it is all over, you should not be depressed. You are free to do whatever you want. This was a game that was played, with the winning team of Eliza and Higgins. But now Eliza, knows that her time is up and has to go back to reality. For Eliza, she has lost. Higgins was very distant, not sympathizing with Eliza, because when the morning comes, it is business as usual. Thru out the scene, it was alway wide shots. You see everything in the room and you think back to Eliza when he picked her up off the street. In both Gaslight and My Fair Lady a woman is under the control of a very selfish man who is dictating how she should behave. The woman undergoes transformation under the clutches of the man. In Gaslight we see Paula gradually lose herself and her sense of identity as she starts to believe she is insane. Her husband Gregory manipulates her in such a calculated way that she is made to feel trapped, guilty and unsure of herself. Paula’s emotional attachment to Gregory does not help the situation either. The themes of transformation, identity, love and manipulation that we see in Gaslight are also conveyed in My Fair Lady. Eliza transforms from a poor class flower girl into a well-spoken, princess-like lady thanks to the strict teachings of Higgins. In this clip we see how distraught Eliza is from losing her sense of self. She is desperately seeking “a little kindness” from Higgins. Cukor uses light and shadow effectively in both films to convey emotional highs and lows and relationship tension. When Eliza bursts into tears Cukor uses a downward angle camera shot and shadow to enhance the character frailty. When Eliza flares into a rage and throws “them slippers” at Higgins the shadow is reduced and we see more light. The contrast in power and stature between the two characters is reinforced when we see Eliza on the couch and Higgins standing tall behind the couch. 1. In both films we are drawn into a very staid setting. Everything elegant and in it's place. Eliza and Paula (Gaslight) seem to fall into the shadows even though they are elegantly attired. They seem to belong there and yet seem out of place. Both women collapse down in emotional distress while the men stand over them making an appraisal of the situation. In both cases the men seem to believe that their appraisal is the correct one and anything that is wrong is due to the women's inability to see the situation as it is. 2. Henry has a real problem seeing anything from Eliza's point of view. He looks at the outcome of the "experiment" from a man's perspective as if no harm was done and the rules of life simply continue. He fails to understand anything from a woman's point of view. He sees his victory as a springboard where Eliza can do anything. The reality of life at that time is the opposite where women couldn't just go out and take the world by storm. She knows this charade has real life ramifications for her. 3. Cuckor initially has them separated. She's behind the piano, near the wall in the shadows. She comes out of the shadows to confront Henry and throws his slippers at him. Slowly they are drawn closer to each other even though Eliza is kneeling and sobbing and Henry is standing over her in a dominant position. But once she stands up and raises her "claws" we see them on equal footing. She's not a man but in that moment of self-preservation she is unafraid to take him on. And yet we can see a person who is conflicted. Her inner expectations don't match the outer result. What Higgins doesn't realize is that he is going to be just as conflicted when she decides that she doesn't need him. 1. Explore any common themes and filmmaking techniques in a very different movie also directed by George Cukor, Gaslight. (If you are not familiar with Gaslight, compare and contrast Cukor's theme in this scene and his techniques with another musical you have seen during this course) In both Gaslight (1944) and My Fair Lady (1964), a man attempts to control a woman for selfish reasons. In Gaslight, it’s for money, and in My Fair Lady, it’s for professional pride. In both cases, the woman’s well being is a price he’s willing to pay, and in both cases, the woman is worn down and angry at the end of the process. In both cases, Cukor at certain point frames the woman as if she is a subject to be studied, a guinea pig on which to be tested. The scenes with Ingrid Bergman in the center of the frame, in the room alone feeling she’s going crazy, are a little like the scenes with Audrey Hepburn centered in the frame trying to learn correct pronunciation and manners. In both cases, the truth gradually dawns on the woman. In this Daily Dose scene, Hepburn’s Eliza finally articulates her frustration at being used by Higgins (Rex Harrison) just as Paula (Bergman) finally confronts Gregory (Charles Boyer). 1. Gaslight and My Fair Lady both show examples of women who are controlled by men. In Gaslight, the husband is trying to make his wife crazy so that he can steal his wife's money. In My Fair Lady, Professor Higgins turns Eliza from a poor flower girl into a society woman. Higgins has control over Eliza by having the money to feed, clothe, and shelter her and not bothering to teach her anything about how to be self-sufficient. 2. Eliza is shown in close-up when she is crying over realizing that she is probably going to end up working as a flower vendor again and have to live on the streets. Higgins is shown as angry that Eliza is ungrateful for everything he has done for her and disinterested about Eliza's future. 3. I notice that Eliza and Professor Higgin's relationship is based more on need than love. Eliza needs everything that Higgins provides for her such as food, clothing, and a roof over her head. Higgins needs Eliza to look and behave a certain way to win a bet. Explore any common themes and film making techniques in a very different movie also directed by George Cukor, Gaslight. (If you are not familiar with Gaslight, compare and contrast Cukor's theme in this scene and his techniques with another musical you have seen during this course). Hepburn's character is full of apprehension in this scene. Experiment over, what's to become of her. It seems she is experiencing an awakening. What is next? Harrison's character completely overlooks the human side, relegating Hepburn to chocolate, an good cry and bed. Gaslight features similar surroundings, and a dominant male with a condescending attitude toward women. Note the emotional transition moments in this scene, how the actors portray them, and how Cukor supports them.﻿ The scene is fraught with emotions, all Hepburn. Harrison could care less about the future of Eliza, now that his experiment is successful and over. The professor completely overlooks what Eliza knows is true. There is no going back, now what is to become of her? What do you notice about the relationship between Eliza and Higgins that seems enhanced by Cukor’s direction?﻿﻿ The experiment is over. The physical separation between the characters mirror the "class" separation in both Eliza and Higgins. The professor seems to have moved on, oblivious to the future of his muse. Eliza tries to evoke some emotion from him, but fails miserably as she moves around the room. Thank you Mr. Long for your insight regarding the comparison between "MFL" and Gaslight. The theme of men controlling women for a specific purpose was eyeopening. You say, that both women are "warn down and angry" at the end of the process. Women throughout history have men controlling their lives for a specific purpose. Eliza wants to get out of her former life and look towards a future. I especially liked the part of the clip that suggests that she will do anything for a chocolate. much like a animal will perform for a treat. We also see in this clip that Eliza is like a child. How many times have you seen parents bring their child into a setting to perform for their co-workers, family or friends. That is Miss Doolittle through out her time with the Professor. I want to comment on the idea that Cukor has the reputation of being a women's director. In this film MFL, he know how to show the audience what Eliza feels. First we see her coming back from the ball where she was the prime attraction. At the Ball, Cukor certainly shows the audience she is the "center of attention." In this clip, we first see her fading into the back of a very large, full room of things. We see her as only a thing. Just like a piece of furniture. Cukor only lets the audience see her through the darkness, by having the lights highlight the jewels she is wearing. The scene in which she is crying, she is placed at the footstool "at the feet of her master" just as a pet or child would find themselves. It is only at the time the professor notices her. Earlier in the film the director points out that her job was to 'fetch" the slippers. Just as a personal assistant or "dog." Here Eliza find herself thinking that this is the only thing I am good for, all for a piece of chocolate? Relationships throughout the film starts with that of need: need of help to survive the world outside. Second, the idea of support. I will support you to help you achieve notoriety. Much like a wife supports her husband. Third as a child or a pet. I will perform to please you, provide an opportunity to show me off and finally as all of the above relationships/ roles we all play during our lives. Everyone of us have been children, everyone of us support someone, we all perform as members in a family. We love many different ways during our lives. Our relationships can sometimes show disgust, dislike, resentment and regret. But we always come back, due to love. This film and its relationship all exhibited . 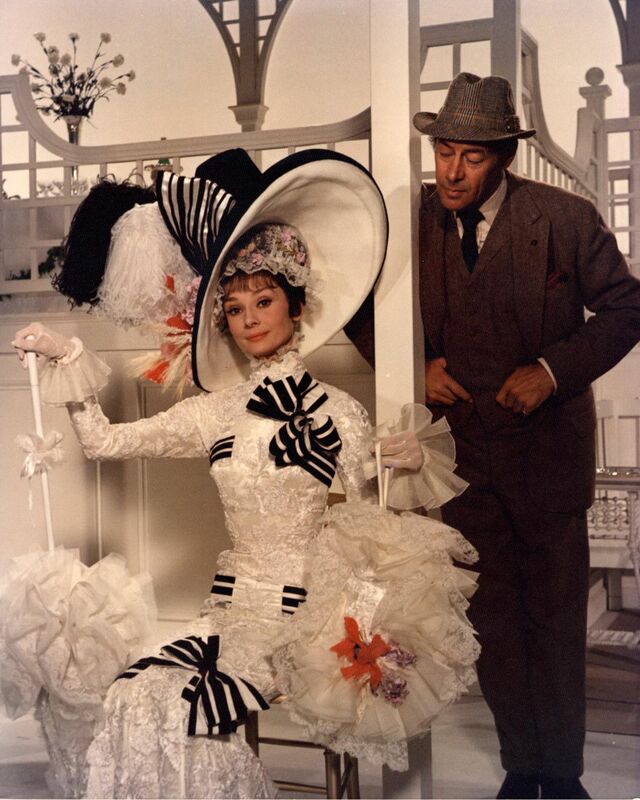 In My Fair Lady , George Cukor placed the lighting around the actors and not so much around the area behind them so you were looking at them not ant the stage and that his what he had in mind . Elisa and Higgins l think had a love hate love relationship, She like him and he like her most of the time but l think is some cases there was a hint of love running threw the both of them that neither wanted to admit to that is just my opinion. l am a person who looks for a love interest in all the movies that has this kind of story line. Explore any common themes and filmmaking techniques in a very different movie also directed by George Cukor, Gaslight. (If you are not familiar with Gaslight, compare and contrast Cukor's theme in this scene and his techniques with another musical you have seen during this course) "Gaslight" and "My Fair Lady" are common in one thing. The plot of both these films revolve around in London. Yes, we could see that the men have designs on their ladies. The fact is that the former wants to get hold of the jewels whereas the latter wants to get a well-polished woman out of her Cockney accent. What do you notice about the relationship between Eliza and Higgins that seems enhanced by Cukor’s direction? We could see that Eliza's time as Cinderella is up and she has to return to her normal life. Eliza is struck by the Cupid's arrow but the Professor was not ready to show his affections yet. 1-The want to compare "MFL" against "Gaslight" is sensible in that there are matching story themes, era, setting, costume and location. Those seem like obvious comparisons, but what is more important to examine is the change in Cukor's style as a filmmaker, regardless of whether or not the themes match up. In "Gaslight" some twenty years earlier, we have a black and white film in which the shots and angles, and general cinematography style is wildly different. 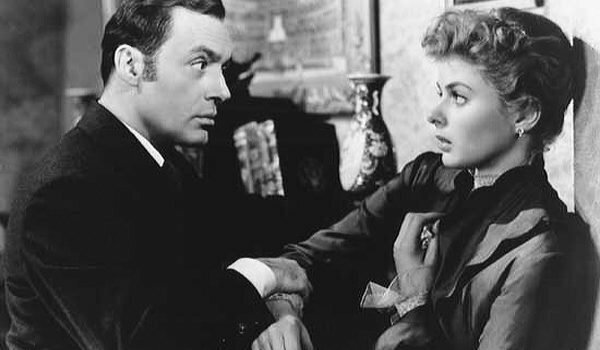 Take the "Gaslight" scene where Boyer accuses Bergman of taking the painting off the wall, we see almost extreme close-ups of BOTH characters, alternating and fast close-ups to to both emphasize the accusation, and his stern and almost creepy chastising, and ones on her to emphasize the feeling she may in fact be losing her mind. 2-Eliza gets the favour in these shots (women's director or not, we are asked to sympathize with her, even from a story perspective) we get closer shots of her, a frame in which she is the clear center with some framing around her, but not as much as Harrison, the colder and more distant character, whom we cinematically do not get close to, as well as emotionally. 3-As stated above, we favour Eliza in the shots, she has more intimate lighting and shadow and she physically shows more emotion, from tossing slippers to leaping like a cat even down to hugging furniture for warmth and comfort. He is kept more distant, instead of using his hands towards her (like she claws at him) he holds out chocolates on a silver and formal tray, everything is set up to support her more earthy and emotional sense and his colder and more distant air. He looks for slippers, she is looking for his love. Both films, Gaslight and My Fair Lady have to do with men denying a woman's intuitions/emotional honesty. The sets were not a particular distraction for me but rather an enhancement of the scene playing out on the screen. In both films, we see a sense of 'there there, don't worry your pretty head about it, everything is just fine' from the principal actors. In comparison to films of the 30s, George Cukor takes a more naturalistic approach to filming scenes. I noticed that in the 30s, emotion was framed by almost extreme closeups of the actors’ faces, while here, Cukor uses wider shots and trusts the actors to project emotion at a more natural angle. & 3. When Eliza is beside herself with anger and sadness, Cukor gives her the screen time to connect the audience to these emotions. Higgins is unbothered by the fact that Eliza is upset and looks at things rationally, in which case he is shot with Eliza in frame so that his lack of emotion plays off of Eliza. In this way, the audience is able to mark where Eliza attempts to quell her emotions only to start them back up when Higgins does not appear to care about her predicament. I liked the first shot, which was a good 50 seconds in length. It allows us to see the reality of Eliza's emotions as she is always central in the frame. We and the camera stay with her. Here, Cukor's direction allows us to sympathize with her and later question Higgin's motivations and manipulations. Without this shot, the tenor of the rest of the scene would be dramatically different, and we would be less able to identify with Eliza. The most immediate thing that I think of when comparing Gaslight and My Fair Lady is lighting. The lighting is essential in Gaslight; it makes the movie. As Charles Boyer slowly drives Ingrid Bergman insane, he uses the light to play on her sense of reality. She moves into a room with the lights turned up, but slowly, they drop darkening the room. She doesn't change them herself, and so on and on, until she loses her grip on what's real. Nothing quite so dark takes place in My Fair Lady of course but the lighting again reflects mood and reality. The places that denote Eliza's old life - the street where she sells flowers and Henry Higgin's home - are all darkly lit, while the race as Ascot and the royal ball are all bright and stark compared to the others. It denotes to me a change in her position in life. Her former self and her space of active transition to her arrival. Emerging from the shadows (her delusion that Henry might change) Eliza turns off the light, symbolizing the end of her hopes for his enlightenment. The lighting creates a somber, dark background where the books and materials used for teaching blur while Eliza is in sharp focus. The sad, soft orchestral music enhances her despair. The music motif changes to “a few more hours” as she pounds the armrest. Her father had a few more hours of freedom before his life changed with marriage. Eliza has a few more hours until an uncertain future. What is to become of her? She has lost her identity as a poor girl in the streets and is in a netherworld of a rigid society. But it is her battered ego that has taken the biggest hit. A victim of Stockholm syndrome, she had fallen in love with her creator but now realizes her folly. Though free, she is still trapped. She pounds the armrest when she realizes that she has been beating her head against the wall. When Henry enters the room, she will not allow him to see her vulnerability. From this crouching position, she will not allow him dominance. So, she hurls the slippers as she rises, hurling a curse on him. His power over her is broken. Henry is confused and she explains in terms he understands, her role in his competitive game. She is no longer willing to be a mere pawn. The camera angle changes from distant shot to closeups as they verbally spar. After being thrown onto the couch, Eliza is again in a subservient, low position while Henry is standing behind the couch, in the dominant position because she demands to know her fate. She rises again, shaking her head at his denseness in understanding her real needs. Henry rationalizes it as imagination and suggests that she go to bed to sleep it off as if the nightmare will be over when she awakens. But the genie cannot not go back in the bottle. “But” has merged with reality and Cukor’s masterful direction propels the plot toward resolution. Explore any common themes and film making techniques in a very different movie also directed by George Cukor, Gaslight. (If you are not familiar with Gaslight, compare and contrast Cukor's theme in this scene and his techniques with another musical you have seen during this course). Both turn-of-the-century, London-based films center around a woman living in a large, fascinating house serving as both a home and a cage (run by a controlling man). What we don't see in this clip is what preceded it--Eliza charming everyone at the ball only to be humiliated back at home by being ignored while everyone else in the house congratulated only Professor Higgins. Her outburst (which seeing only the clip might seem like needless histrionics) had been building up for a long time. While Higgins maintained his professional, in-control calm, it was the first time he was jolted into realizing that Eliza actually had some feelings about being a part of this "experiment". Often a relationship needs to "come clean" to move forward. While both Eliza and Higgins are so angry that they yell at each other, Cukor shows that they also have never been so honest with each other nor so physically interactive.